Good morning! It's my Farm Girl Friday today!!! Thanks Lori, for inviting me along on your Farm Girl Sew Along. 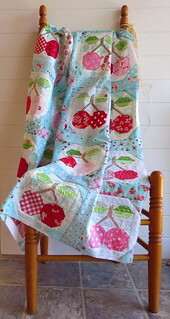 When I paged through my Vintage Farm Girl book I fell head over heels for this cute Pie Cherry Quilt. I just kept wishing I could see a picture of the whole quilt. I looked around online and then lo and behold when I was visiting Nanette I saw the REAL PIE CHERRY QUILT at Thimbles and Threads in Draper. Don't you love Lori's version? I kept to her color recipe, using aqua and white backgrounds and aqua sashings.. and I think I have a nice mix of pink and red cherries. While I was making it I thought it would be fun to have red and yellow and pink cherries, Ranier cherries are so pretty too. My favorites are the dark Bing cherries that are grown in our area here. On my Utah vacation I collected up a bunch of aquas to use, and some white with aqua background prints, and then of course went to my stash of Pam Kitty Fabrics for the pinks, reds and greens. I also picked up a couple of soft browns that wouldn't be too bold for the stems. I like how they turned out. Just the right intensity I think. All my sewing without lights resulted in some mismatchiness, but you know, honestly, I don't care. I'm in love with how it turned out. I was planning on using Lori's patchy borders, but now I think I'll use my aqua swirl print.. I'm just not quite sure yet. So don't worry, this won't stay a UFO for long. Ok, did you make some Pie Cherries? I can't wait to see all your blocks on Instagram! The tags for this block is #piecherryblock #piecherryquilt #farmgirlfriday. 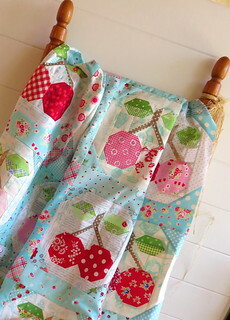 Love your Cherry Quilt! You did a beautiful job! Thank You also for sharing the full Cherry Quilt of Lori's!! I too want to make this version, but with little red barns and aqua sashings first. So cute Pam! I love the scrappy happiness in the blocks. Have a great weekend! I do so love this! I wish it were a kit because the colors are already perfect and I wouldn't have to spend hours trying to find just the right mix. I REALLY like your Cherry quilt!! You did a great job! Can't wait to see it quilted! Your quilt is so pretty Miss Kitty. You are my favourite! This quilt is beyond gorgeous!!! I love it Pam! Now I want to make one too! It is as cute as cute can be!!!!!!! YOUR fabric would be perfect with it! Oh wow. It turned out so incredibly cute. I love it. How could it not be perfect? it is. I like your version. 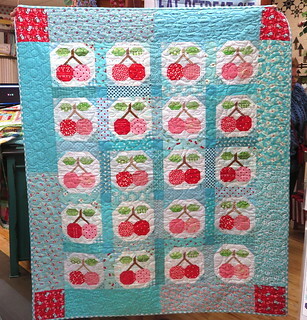 Cherries make for a happy quilt. There might be a cherry quilt in my future. As always, you inspire me.